Sodom are one of the most iconic bands in metal’s history. Their aggressive brand of metal was revolutionary and has influenced not only the thrash genre but also black and death metal as well. Along with their German counterparts Kreator and Destruction, they changed metal forever. 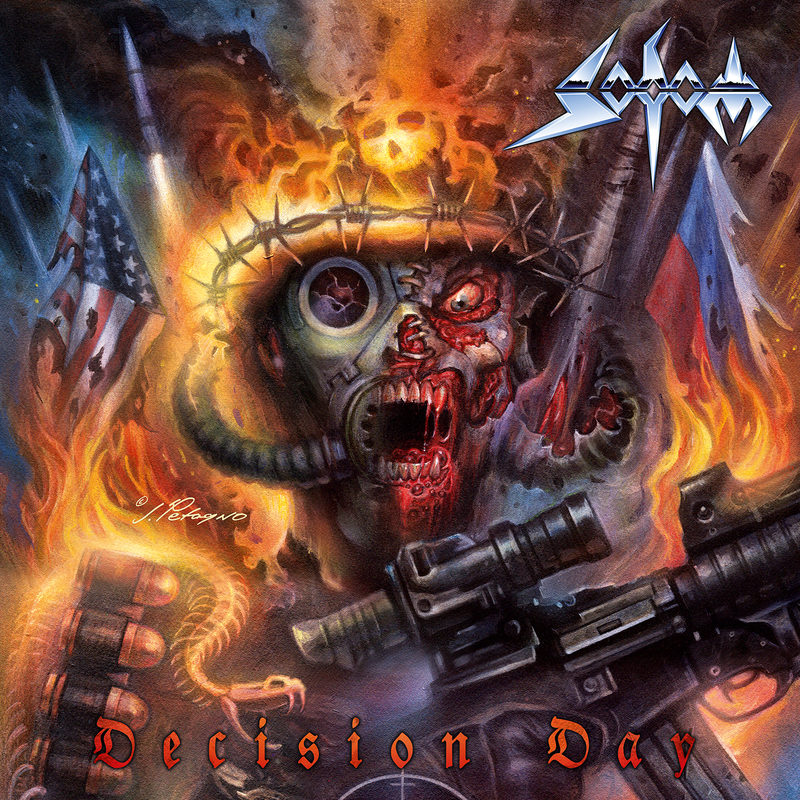 As they unveil their fifteenth full length release Decision Day to the masses, Sodom have proven to be better than ever. After a string of average releases, Decision Day is their best album since 2001’s razor sharp M16. Led by vocalist/bassist Tom Angelripper, the songwriting is refined and meticulously looked over. At 53, Angelripper sounds incredible. He has never sounded as destructive and aggressive as he does here. He utilizes different characteristics to his voice and continues to grow as a singer. Throughout the release he adds guttural roars and a new black metal shriek that he has newly developed. Opening track “In Retribution” is a whirlwind affair. After a brief clean intro, guitarist Bernemann lets loose on a blazing fast riff that is reminiscent of Sodom’s heyday. Angelripper is bludgeoning throughout the verses before a melodic chorus kicks in with a memorable melody. A killer solo punctuates the song as an instant classic. “Belligerence” could be Sodom’s most destructive song of their lengthy career. It opens with some quick tremelo picking before the tempo comes to a halt with a crushing riff and a demonic Angelripper spitting out the melody. The chorus shifts the tempo to incredible levels with blast beats backing a venomous Angelripper. I have never heard him roar as he does here. There are also more melodic tracks like the instantly accessible title track and its stunning chorus. “Strange Lost World” could be pulled from M16 with its slow chunky riffs and catchy melodies. The newly re-recorded “Sacred Warpath” sounds more alive and energized from the original version. A killer solo by Bernemann showcases his great lead playing. “Rolling Thunder” is another standout track that will be impressive live. A throwback song that could be taken from Agent Orange features blazing drum work from Makka. His double kick work is precise and quick. My favorite lead of the record finds Bernemann shredding once again. The acoustic breakdown contains an eerie whisper from Angelripper before blasting into another tremendous chorus. The album ends on the groove oriented “Refuse To Die,” with a riff that is so heavy your neck will shatter headbanging along. Angelripper once again spews forth his demonic vocals with venom he hasn’t shown in years. The chorus is anthemic and you will be screaming “Exorcise, Dehumanize, Exorcise, Refuse To Die” until your voice is gone. Simply put, Decision Day is brilliant. Angelripper and company seem to be out to prove that they aren’t resting on their laurels and their past accomplishments. This is their best album in 15 years and easily a candidate for album of the year. It is not every day when a band can retain their classic sound and incorporate brand new elements into their songwriting 35 years into a remarkable career. That is exactly what Sodom has achieved.